Kayne West once sang, "In the night I hear them talk, the coldest story ever told. Somewhere far along this road he lost his soul..."
Thirty seconds. That's all that was left of the game and Ghana would have been the first African team through to the World Cup semis. 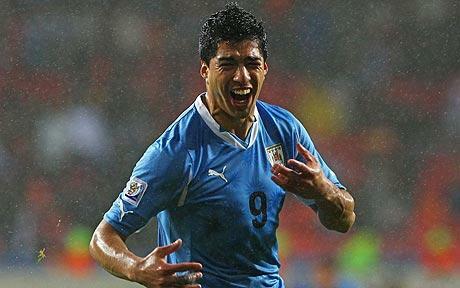 Instead, Luis Suarez ripped the heart out of Ghana and danced on it at the mouth of the Uruguayan goal. Now, granted, he obviously and rightly received a straight red for his actions, but the denial in the dying seconds put all the pressure on Ghana's Asomoah Gyan. Gyan's penalty shot smacked the crossbar with the force of a heavy handed pimp. The resulting deflation of Ghana's spirits was tantamount to their collapse in the resulting penalty shootout where Uruguay's Fernando Muslera managed to stop twoof the five shots. Had the crossbar not saved Gyan's initial penalty in extra time, the shootout would never have happened. Had the crossbar never stopped the shot, Ghana also would arguably never have felt the tide turn against them and could have possibly won the shootout had this been the score been 0-0 at the time. But, it wasn't meant to be. For those unfamiliar with the straight red that Suarez was shown, previous attempts by teams to stop what would be considered "sure goals" by handling the ball were becoming frequent enough in recent years to force a decision by FIFA to prevent it from occurring. FIFA thus ruled that the player handling a ball in such a way as to prevent a goal would be immediately red carded (team would be short a player for the rest of the game & that same player would miss the next FIFA sanctioned match). In this case, Suarez must have deemed Uruguay's possible elimination warranted his hand ball and went into Uruguayan annals as a hero while Ghana will forever villainize him. The villainization, I think, is rightly justified as time was expiring, so technically, his team would suffer no loss of field players or of people to shoot penalties. This was a harsh example of why the red card for handling balls in the box is justified. Ghana paid the price, but FIFA had given every opportunity for Ghana to even the score. Remember that in 2009, 81% of all penalty kicks taken resulted in a goal according to an earlier article here and researched by the Wall Street Journal, so this was almost a sure thing. There may have been no Kanye in South Africa tonight (although I'm sure he'd run on the field to interrupt the red card) but there was some heartless dude on the pitch and his name was Luis Suarez. As noted earlier, in commentary, Suarez's one game ban has been upheld by FIFA after it was ruled that banning him for any long would be "complicated" on July 3rd. I was so upset after the shootout when Asamoah Gyan wasn't able to show his face. Sure, he missed the penalty at the end of the game, but the coach showed confidence in letting him shoot first in the shootout, and Gyan converted. Too bad his teammates didn't do the same, but Lazio's Muslera was just plain superior to Wigan's Kingson. I saw Gyan heartbroken and ashamed at disappointing the whole continent, and my kids and I (all wearing red jerseys like Ghana, by coincidence) stood up in our house and applauded Asamoah Gyan and the Ghana team for coming closer than any African team has ever come to the semifinals. And, oh yeah, if you had Luis Suarez on your fantasy team, enjoy your filthy red card and negative points. If you ARE Luis Suarez, enjoy being labeled a cheater the rest of your life. Ask Diego Maradona or Thierry Henry how long it takes people to forget illegal handballs that change the outcome of big matches. Umm, yeah so I had Suarez on my fantasy team and I'm not proud (who knew he'd try this during the game?). "Gyan smacked the crossbar with his penalty shot with the force of a heavy handed pimp."